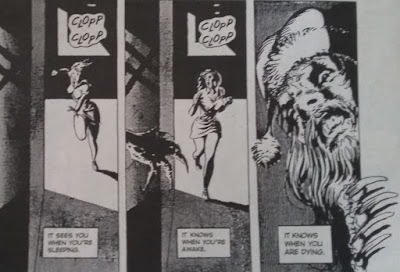 In 1991, Dave Olbrich and RA Jones wrote Santa Claws, the story of an... evil... Santa Claus, terrorizing a mall and chasing, in particular, a very attractive clerk named Nicki. It's full of great puns on old Christmas carols, like this one. 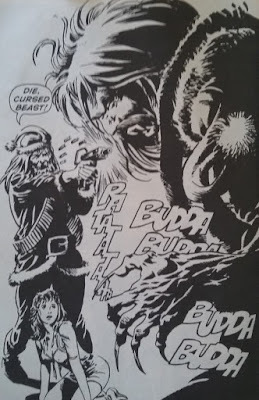 And the first thing Santa Claws does to Nicki? Rip her blouse open. This makes her run around the entire mall throughout the entire comic with her blouse wide open and her cleavage hanging out. 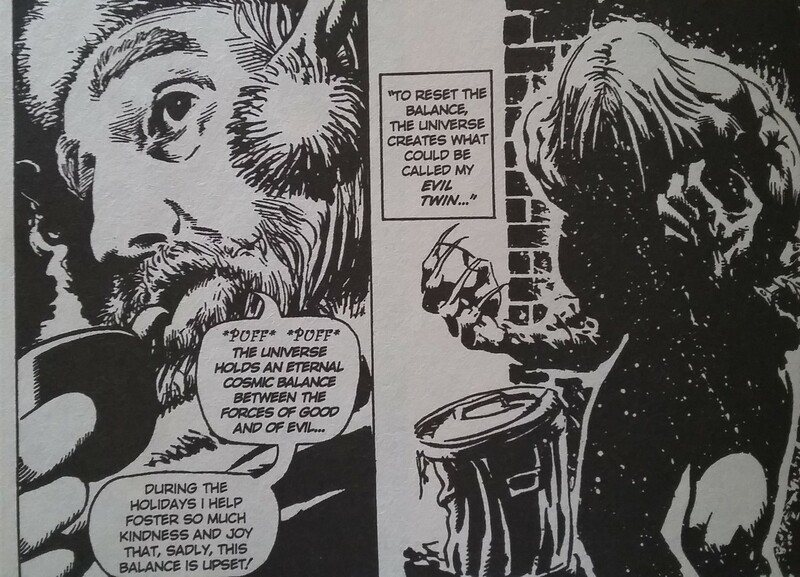 Were the writers going for actual horror here? I have to believe the camp is on purpose, because it's so ridiculous. She basically gets posed in all sorts of gratuitous model-esque shots while everyone around her gets killed by Santa Claws. But she outlasts Santa Claws by getting to the roof until someone comes to her rescue. Guess who? 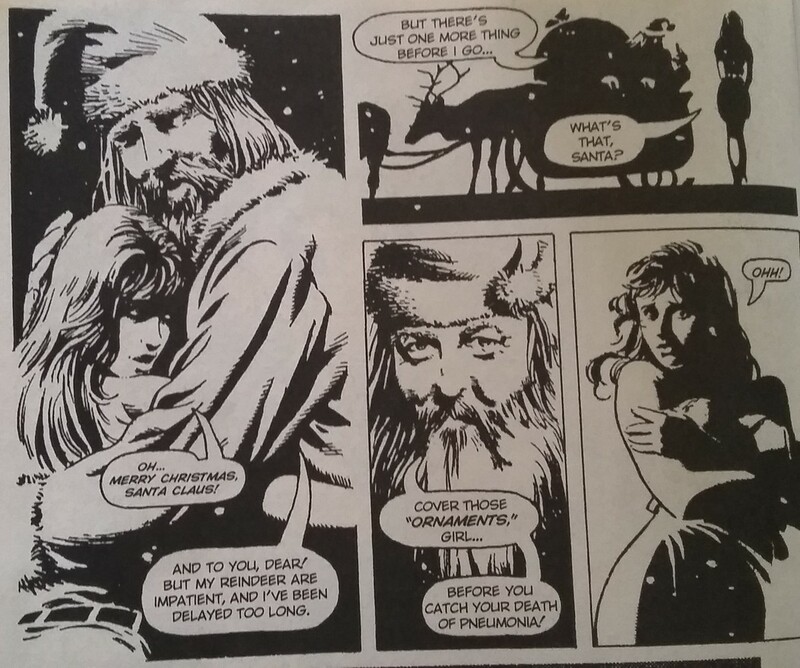 That's right, it's the real Santa Claus. And he's got a gun. A huge gun. 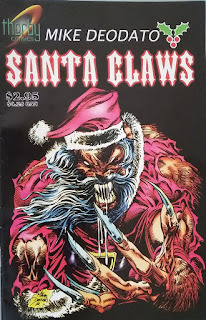 With Santa Claws out of the way, Santa Claus discusses how Santa Claws came to be. The Anti-Christmas. Look at that. That doesn't even work when you say it. Go ahead. Try it. It's awesome. 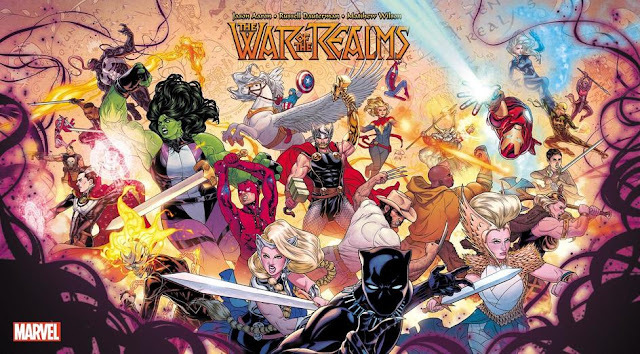 This comic is so awesome. And so ridiculous. 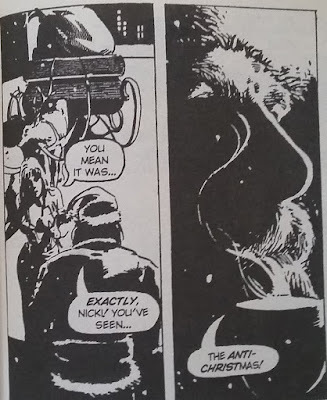 And so it ends with Santa Claus and Nicki wishing each other a Merry Christmas, with Nicki being given a happy ending (her boyfriend gets to live — never mind all the rest of the people in the mall that Santa Claws killed). And of course, Santa leaves her with some words of advice. 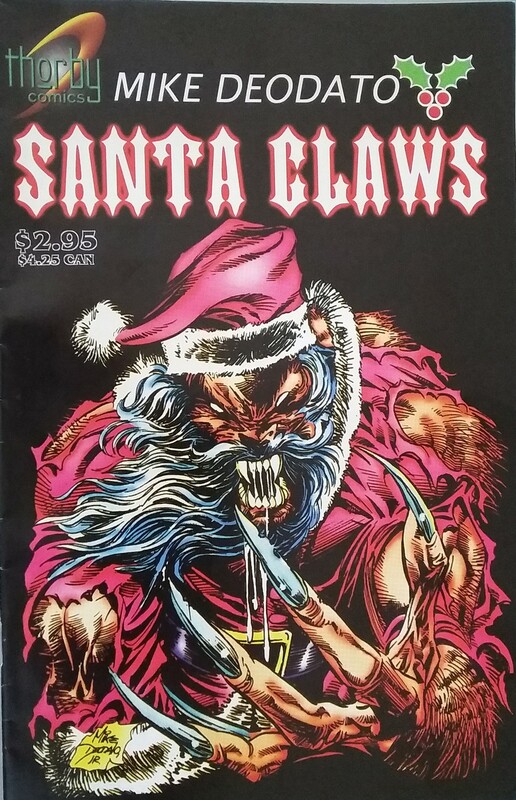 Over the top, gratuitous, and extreme — Santa Claws is so bad it's amazing, and says so much about comics in the 90s. I couldn't stop turning the pages, and I had to share it with all of you. 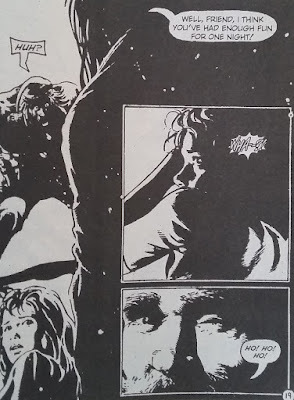 Did I mention this was the first ever published comic work of now-comic book master Mike Deodato? 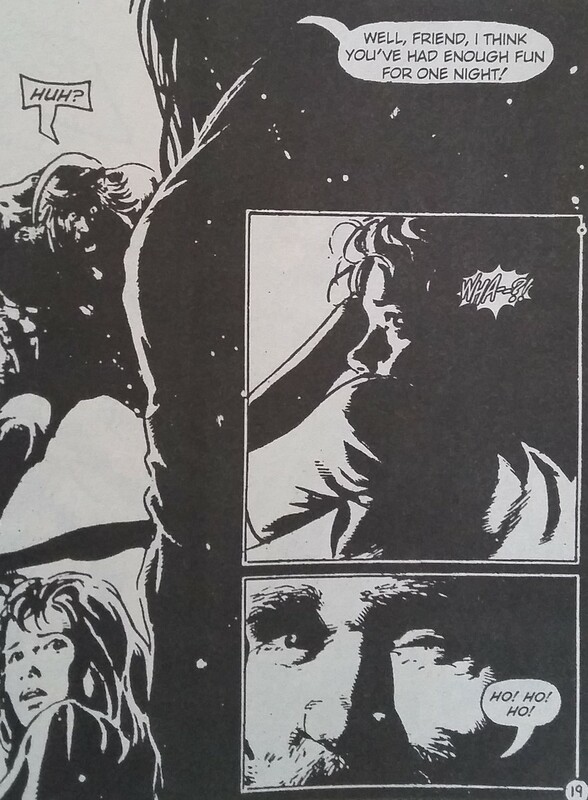 In 1998, Thorby Comics reprinted it when Deodato was getting bigger. So there's your random fact of the day. Merry Christmas, everyone. Remember to cover your ornaments before you catch your death of pneumonia.